The Mt. Dora Center for the Arts will be displaying a month long exhibition of selected works from the collection “Sutra”. Yatin work will be displayed at Snap. SNAP is a project of The Lucie Foundation, a national 501(c) 3 charitable foundation with the mission to celebrate master photographers, discover and cultivate emerging photographers and promote the appreciation of photography worldwide. “Urban Wild” – a group show curated by Patrick Kahn, featuring selected works from local photographers, will be exhibited in the Martin and Gracia Andersen Lakeview Promenade of the Orlando Museum of Art. The Prostate Cancer Foundation "Celebration of Life"
World renowned Dr. Vipul Patel, the medical director of the Florida Hospital Global Robotics Institute in Celebration, has operated on more than 5,000 men from around the world who have suffered from prostate cancer. Dr. Patel has joined forces with Yatin to raise public-awareness of this dreaded disease. 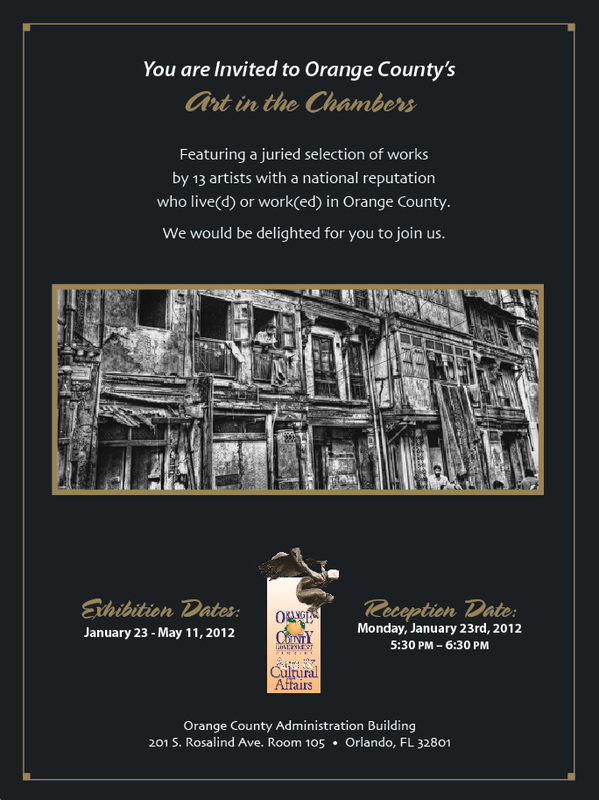 Orange County "Arts in the Chamber" has selected 13 nationaly recognized Orange County artists to exhibit pieces at the Orange County Administrative Center. Join us at the opening reception on January 23rd from 5:30pm - 6:30pm. On November 11, 2011 Yatin displayed part of his collection SUTRA as part of the “Culture and Cocktails” social event at the Maitland Art and History Museum. Yatin Patel hosts, benefiting the University Club Foundation which contributes funds to five local institutions: Seminole State College, Valencia Community College, University of Central Florida, Hamilton Holt School at Rollins College and FAMU College of Law. Each school receives funds to distribute to qualifying students. Florida Hospital for Children Board of Director members Michael Ward and Mark Moore host, benefitting Florida Hospital for Children. A foundation created for little 2 year old Recolon Jumpp, who soon will be facing a bone marrow transplant in which his family will be incurring exorbitant medical bills. AAP is a foundation in Orlando which collaborates with the GAP (India) to raise awareness and prevention, as well as create a climate of understanding towards all those who are affected by HIV and AIDS. A non-profit resort that creates magical memories for children with life threatening illnesses and their families. An evening to benefit education for those in our community in need.